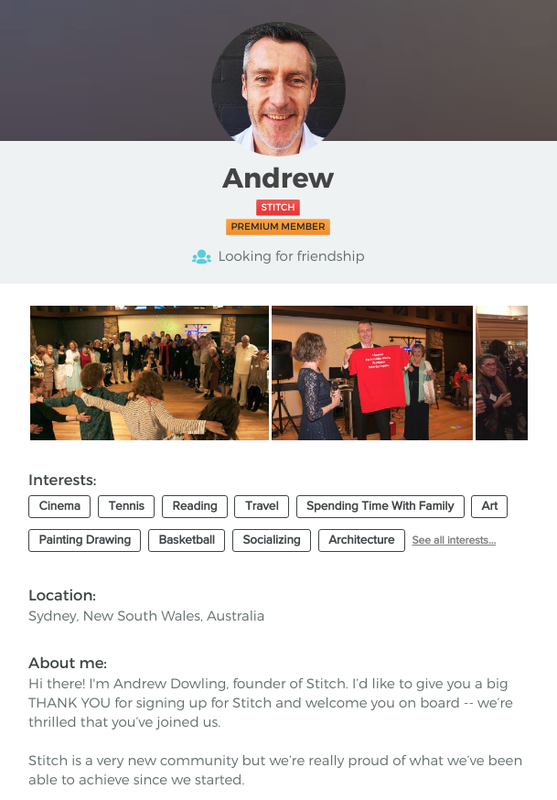 The Members page on Stitch lets you view the profiles of other members in your local community, and decide whether you would like to connect with them or not for one-on-one communication. The sections below describe each of these in turn. The Browse page shows you profiles of Stitch members who fit your Search Criteria, one at a time. At the top of the page you will see the Stitch member's primary profile picture, along with their name and key information about them, as shown in the image below. At the bottom of the page you will see three buttons plus an additional menu, as shown in the picture below. You need to choose one of these buttons (or one of the options under the More menu) in order to make a decision on this profile and move on to the next one. Choose Back to be taken to the profile or page prior to the one you are currently viewing. The History page is, as its name suggests, the place where you can view a list of all the profiles you have seen, along with the decision you made on each one. To get here, select Members from the top menu, then History from the submenu. 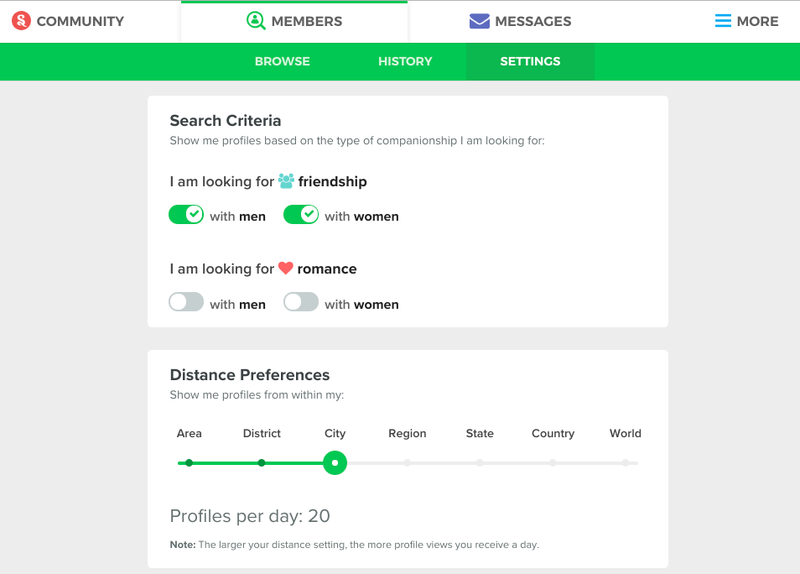 If you previously Skipped a profile, or saved someone for Later, you are able to change your decision by opening their profile and choosing a different option. If you previously sent someone a Message, you can't change your decision, as the other member will already have been sent this message. You will also notice filters on this page, as shown below. They include All, Messaged, Saved, Skipped and Dismissed. Select a filter to bring up the list of people within that category. For example, if you would like to see a list of all the people you have messaged, select the Messaged button. If you would like to see who you have skipped, you can do so by selecting the Skipped button. For each of the above you can select what gender you are seeking; for example, you may be seeking romance with men, as well as friendship with both men and women. To choose a selection preference, set the appropriate checkbox to ON. If you have subscribed to our latest Premium membership plan, you will also be able to change your distance preferences to determine whether you see profiles from within your local area, or more broadly within the Stitch community.